The Famous Grouse produce blended Scotch whisky, but what makes it particularly special in my opinion is that the blend includes whisky from two powerhouses of Scottish whisky: Highland Park and The Macallan. 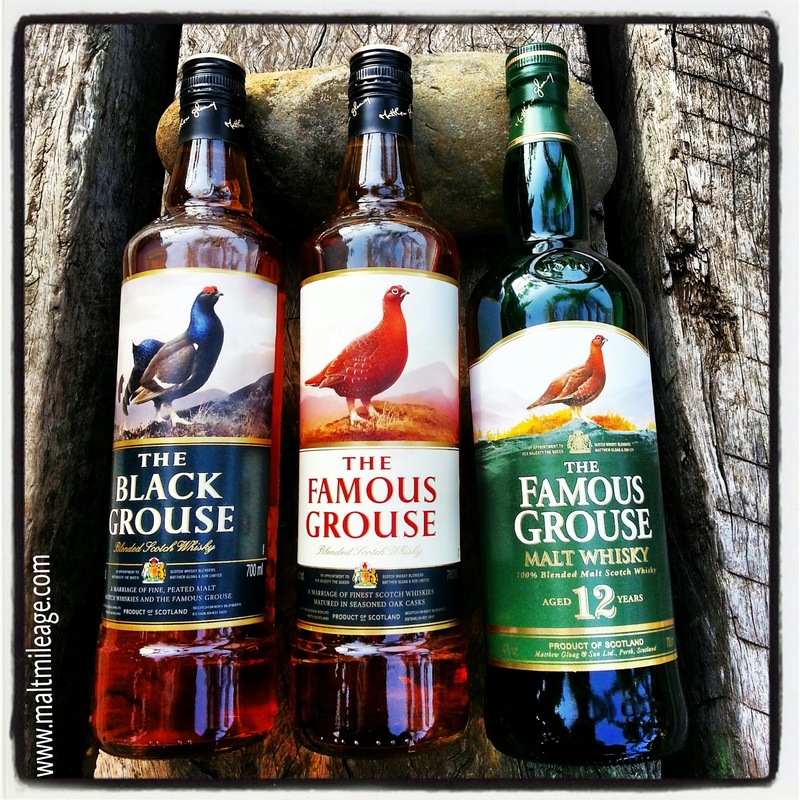 In this post I taste and review the Famous Grouse and Famous Grouse 12 Year Old. I have also reviewed Snow Grouse. In my view you get what you pay for, but I think the Famous Grouse 12 Year Old is an absolute gem and a bargain at the lowly price of about $38 (shop around, as prices do vary). The Famous Grouse is good, but it has a mild theme of immaturity running through it. These Famous Grouse whiskies are excellent value and while you should not be expecting much at their pricing, they do pleasantly exceed expectations. The stand out is the Famous Grouse 12 Year Old. A big sweet burst of syrupy tinned peaches starts the sugary assault with a creamy custard-like mouth-feel, which is moderated a little by the bitter strike of the distillate and a mild oak influence which then recede into a finish of cough lollies. Nose: Youthful and energetic, the musty smell of immature spirit weaves around the sweet glazed stone fruits as a note of wet dough and nail polish remover flickers gently in the background. There is definitely an alcohol theme in this whisky, which gives rise to memories of distilled plum spirit. The alcohol does not dominate, but it is there as the other character of the whisky expresses itself with some degree of energy but nothing overly impressive. Taste: This whisky has such a beautiful mouth-feel. It is creamy and coats the palate, but then comes a surge of syrupy sweetness almost like tinned peaches that are never brought into line by the light oak influence in this whisky. The sugars dominate, with some sweet caramel and golden honey layered over the very nicely distilled alcohol which releases some bitterness while the oak also fights off some of the sweetness. Finish: The sugars remain on the palate with the enduring glow of butter-menthol lollies, as it has an almost medicinal quality. This is not necessarily bad. At its price, the Famous Grouse is excellent value. It is also very good whisky, and thoroughly enjoyable. It does have some immaturity about it, but that is to be expected with a whisky of this price. Chocolate thick shake with glazed cherries and apricot are interrupted by bitter oak and cocoa as passion fruit seeds layered over apricot crème brule develop into a finish of rum n’ raisin and coffee and date. The gritty barley sparks in the creamy waves of elegant preserved fruit jam and creamy vanilla, and some magic from The Macallan and Highland Park shine. The Famous Grouse 12 Year Old is 100% blended malt Scotch whisky, and it includes whisky from Highland Park and The Macallan. Nose: The Famous Grouse 12 Year Old is denser in the glass than the Famous Grouse, and it releases a rich aroma of creamy vanilla with light fruit-jam notes (strawberry, in particular) and flecks of grainy barley that do not bring with it the less pleasant smell associated with new spirit; very well done! While it is quite sweet the oak has done its job, as dried apricot and glazed cherries are blended into a milk chocolate thick shake. There is freshness on the nose, almost like melting ice. The malt and barley are beautiful, as they shimmer gently and release some high quality spirit. Notes of bay-leaf and nutmeg develop in the glass as the whisky rests, with a beautiful floral bouquet. Taste: Almost seamless. The mouth-filling whisky is superbly balanced, and no single feature jumps out which shows that each component of this whisky work as one beautiful whole. First the milk chocolate coats the tongue as the buttery creaminess recedes and the bitter cocoa gains intensity slightly, but just as the bitterness grows sour/bitter passion fruit seed and creamy apricot crème brulee provides balance with sweetness, some sourness and tang. There is a creaminess on the palate that mingles with a sugary caramelised bitterness, but this is not overly sugary because the oak does a fantastic job with some beautiful chocolate notes, vanilla and mild bay-leaf with nutmeg. Coffee and date cake begin to develop on the palate, indicating a superbly complex whisky, as the sweetness is then moderated by the dry smack of oak. Finish: The character gently remains on the base of the tongue as the dry oak and some bourbon-like notes create a lasting impression of vanilla bean and rum n’ raisin; lovely! Rich complexity showcases some exceptionally distilled whisky that express great maturity as the oak influence and the distillate work beautifully together. This whisky is silky smooth and incredibly drinkable, mild mannered and light. At its price, it is fantastic value. Being at 40% ABV, this whisky is light and mild mannered. Be warned, this is a sweet expression.